Megas Seirios Publications, founded in 1983, publish books of practical philosophy as well as literary texts, novels and poems. The aim of the publishing house is to contribute to the reader’s deepening into rich spiritual creations of Greek writers and finding simple and easy to apply answers to everyday matters, such as human relationships, education, the way we relate to ourselves etc. "Megas Seirios" Publications has received a plethora of reviews from the country’s literary and political world for our contribution to Literature and Philosophy through books. Dedications and analytical presentations made by the media, praise both our books' thematology and the simple way of conveying a new attitude and position towards everyday life. The books “Man - Exploring his Position and Role in Society”, “Woman - Exploring her Position and Role in Society” and “Couple - Exploring its Position and Role in Society” have been approved by the Ministry of Education and Religion to be distributed in the school libraries of the country. In 2009 Megas Seirios celebrated its many years of presence in the philosophy and poetry field with a presentation of our overall work at the Philological Association "Parnassos". In 1993 the same Association had honored the poet and philosopher Dimitris Kakalidis, founder of Megas Seirios Publications. A presentation of the philosophical, poetic and essay-work of Dimitris Kakalidis took place on the 1st March 2010 from the poet and writer Mrs. Eleni Apostolidou - Loukatou in an event organized by the National Association of Greek Literary Writers. On 18th May 2010 the work of D. Kakalidis was also presented in an event of the Panhellenic Association of Literary Writers by Mrs Apostolidou-Loukatou, whilst abstracts and presentations of his work are being published in well-renowned literary magazines of the country. Our books are donated to Public Libraries within Greece and abroad, as well as school libraries, correctional facilities, writers, academics, politicians to name a few. Several of our publishing titles have been translated into English and are available internationally in paperback or as e-books for easier accessibility through the internet. 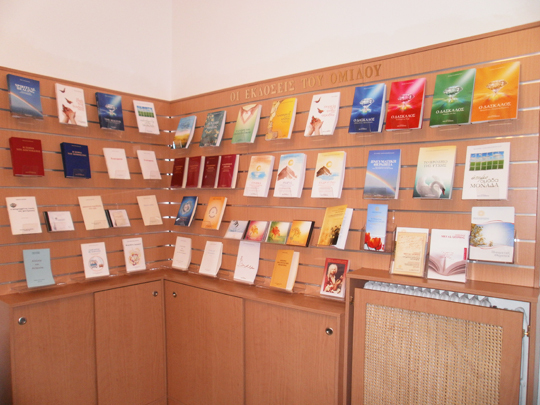 Megas Seirios Publications operate under the auspices of the Spiritual Center “Omilos Eksipiretiton” (the Servers’ Society).